Anne specialised in making 1/12 scale miniatures. She developed a national reputation for her skills in this specialisation. There was a permanent exhibition that included much of her work at Oban in Scotland. The exhibition has been moved to the World in Miniature exhibition at Strikes Houghton Hall Garden Centre at Carlisle. This library is now on permanent exhibition at Houghton Hall near Carlisle. The books are all individually hand made and open to reveal the text. Note the model galleon on the writing desk and the model railway engine on the Davenport. 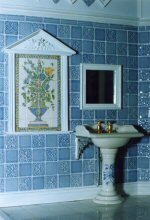 This bathroom was commissioned for the permanent display of miniatures at Oban. She made wicker work furniture out of the thinnest cane available. This is another view of the bathroom commissioned for the permanent display of miniatures at Oban and now at Houghton Hall near Carlisle. A Georgean Room created by Anne. The carvings above the doors and on the ceiling were whittled with a pen knife. A snooker room. The snooker table and cues were made specially for this commission. Everything else was made by Anne. This room is now on permanent exhibition at Houghton Hall near Carlisle. A room based on a bedroom at Clogger Hall in Swaledale. The components for the brass bed were all turned on Anne's Unimat lathe. Everything in this room except for the china and candle sticks was made by her . A tiny mouse room created in a straw hat. Another library. The carvings are all hand carved. The table and chairs were made by John Hodgson. The bureau was made by Graham Greatrix. Even the wooden vases on top of the shelves were turned by Anne on her miniature lathe. 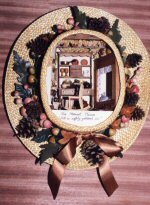 Anne was known nationally and in America for her fine 1/12 basketry. These are a few examples of her work. The cane used has a diameter of only one millimeter. Anne also made some very large objects as well. 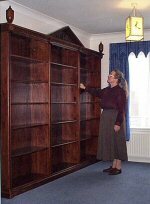 This is a bookcase complete with a secret compartment that she made for her son Adam. This is Beacon House based on a Painted Lady in San Francisco. 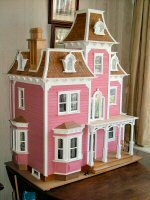 It is Anne's largest Doll's House piece and took her several years to make. Time overtook her and she did not manage to complete it. This is a nativity set. Every item in this set was made by Anne. The figures were made by using her lathe and by carving with a pen knife. There is baby Jesus, Mary, Joseph, three kings, three presents, three shepherds, three sheep, two cows and a donkey. Last modified on 5th of September 2013.